Holiday greetings: This post is adapted annually for your reading pleasure. Spector’s influence is clear—you can hear his signature claustrophobic effects, similar to those on the Paris Sisters’ “I Love How You Love Me” and the Teddy Bears’ “To Know Him Is to Love Him.” But there is another ghost of rock and roll past in the room: The song borrows the feeling and the melody of “Pledging My Love” by Johnny Ace, a well- known Lennon favorite. The persecution of peacenik Lennon as well as his end have been well-documented; Ono continues to work for peace and against gun violence and nearly 50 years since its release, their seasonal single and collaboration has taken on a life of its own. 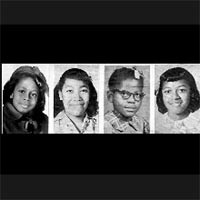 It was 55 years years ago that the four Birmingham, Alabama girls, Addie Mae Collins, Denise McNair, Carole Robertson and Cynthia Wesley, lost their lives during the bombing of the Sixteenth Street Baptist Church. In 2011, a marker was finally dedicated in their names at the site of the vicious, racially motivated attack. Just three months after the murder of Medgar Evers in Jackson, Mississippi, and two weeks after the March on Washington and Dr. King’s momentum-building “I Have a Dream” speech in 1963, the Alabama tragedy became the pivotal event in the Civil Rights Movement. Singer Nina Simone wrote “Mississippi Goddam” in immediate response to hearing the news:“I shut myself up in a room and that song happened,” she said of the song that begins, “Alabama’s got me so upset.” From that moment forward, Simone was committed to writing and performing material that would jolt people awake or into action. It remains her most enduring work. Joan Baez, had of course walked alongside Dr. King at the marches in the South all along; her tribute was a recording of “Birmingham Sunday” by her brother-in-law, the writer Richard Fariña. Each girl was remembered by name in the verses, set to the tune of a beautiful folk melody. Fifty-five years on, both songs remain painful reminders of the brutalities waged here and yonder, year in and year out, by so-called humanity. From Ali Farka Touré to Tinariwen, the music of Mali is as diverse as that of the US. This summer, one of the country’s finest combos, the rock/electronic/blues duo Amadou & Mariam, return to the states for a series of shows. For this month’s column in Tourworthy, I capsulize their history and speak to some of their collaborations with alternative musicians around the world. I also talk to noted disability scholar, Leroy Moore Jr. about the realities of musicians from Africa touring with disabilities (Amadou & Mariam are both legally blind). Take a look and listen to the couple’s new single, “Bofou Safou,” and link to the full story here. Formed in 1981 in Osaka, Japan, Shonen Knife, founded by sisters Naoko and Atsuko Yamano are still going strong. Cheered to hear of the pop-punk band’s recent US tour dates which they dubbed The Ramen Adventure Tour, I’m reprinting a portion of an interview with Naoko which appears in my book, Rip It Up: Rock ‘n’ Roll Rulebreakers. Three Japanese women named after a brand of penknife seem the unlikely embodiment of punk rock, yet Shonen Knife may be among the genre’s last rebels. The power trio makes a pop-punk noise comparable to the Ramones, and counts Sonic Youth, Redd Kross, and the former members of Nirvana among their fans. But after six albums, fifty singles, and more than ten years together, in 1995, the band was headed stateside in search of a record deal, having cut all management and US label ties. The band’s album prior to its split with Virgin Records, Rock Animals, had a metal-lite sound and hellbent for leather meets Spinal Tap graphics that may’ve given the wrong impression to listeners. The members of Shonen Knife came of age at a time when forming a rock band was a serious transgression for girls in Japanese society; they’ve since toured the world, including a stint opening for Nirvana, and remain duty-bound to their mission. Against a backdrop of escalating war in Vietnam and social and political mayhem to accompany it at home, by the late ’60s and early ’70s, the conditions were perfect for hard-hitting topical rock and soul songs to step in and document the times. John Lennon put forth “Imagine,” the follow-up to his and Yoko Ono’s initial bursts of song devoted to giving peace a chance. Marvin Gaye voiced his concerns in “Inner City Blues (Makes Me Wanna Holler),” “What’s Going On?” and “Mercy, Mercy Me (The Ecology),” while Cat Stevens boarded the “Peace Train” that would ultimately take him to study the Qur’an and inspire a conversion to Islam. At the height of the era of music for change, it was more or less expected serious artists would weigh in during times of trouble with a song. From the chart-busting Motown artists who began to draw from a repertoire that was Blacker and stronger, to the rush-released recording by Crosby, Stills, Nash and Young of “Ohio” concerning the shooting tragedy at Kent State, the appetite for topical songs in the US was spurred on by their chart successes. Of course it was Bob Dylan’s early ‘60s pro-civil rights and anti-war songs that were the catalysts for the decade’s new strain of rock and soul music with a message. Dylan’s arrival in Greenwich Village in 1961, to a scene informed equally by poetry and politics as it was jazz and folk, found him mastering pointed and topical song form early on, from “Blowin’ in the Wind,” “Masters of War,” and “A Hard Rain’s A-Gonna Fall,” to “The Times They Are A-Changin’,” “Only A Pawn In Their Game,” “Ballad of Hollis Brown,” and “The Lonesome Death of Hattie Carroll.” He followed his first act with his famous retreat from political songs and folk music. Resisting the tag, “voice of a generation,” he leaned more toward poetical and philosophical lyric forms, rather than those polemical or topical and developed his own world of song perhaps best exemplified by the rambles, “Like A Rolling Stone,” “Desolation Row,” and other epics on the trilogy of albums, Bringing It All Back Home, Highway 61 Revisited, and Blonde on Blonde. From 1966 through much of 1971 Dylan remained in self-imposed exile, off the road and away from the spotlight. Making his way back to performing in public for the first time since his Isle of Wight concert in 1969, Dylan appeared at Madison Square Garden on August 1st, 1971 at the Concert for Bangladesh, the model for all of today’s all-star charity events. Organized by George Harrison and Ravi Shankar, the rally for Bangladesh raised awareness and funds for the residents of East Pakistan and Bengal India, regions beset by complications of war plus a cyclone and the flooding and famine that followed. An already troubled region was now devastated, and as Shankar outlined the situation for concert-goers, Dylan helped to draw them, performing “A Hard Rain’s A-Gonna Fall,” as well as a handful of more apolitical songs. Not long after the concert, on August 21, 1971, George Jackson was shot to death during an alleged prison escape and Dylan would once again pluck his subject matter from the headlines, returning to his roots as a social and racial justice singer. One could suggest it was Harrison’s and Shankar’s example of engaging with the world outside their door that inspired Dylan’s subject, though perhaps it was more a matter of his coming to terms with his own gift for topical songs. Dylan’s relationship to the political world and the matters he chooses to champion or protest have been the subject of much debate, discussion, and inspiration for over 50 years; his life and songs have been over-analyzed and well-examined, but the 1971 single, “George Jackson,” a remembrance for the radicalized convict and Black Panther who died in a San Quentin prison shoot-out remains one of his most intriguing cuts. Not only does “George Jackson” mark the songwriter’s return to topical song form and to touring, its subject remains almost mysterious and misunderstood to the general audience as the singer himself. Landing in California following a life on the streets of Chicago, a 70-dollar robbery is what landed Jackson in state prison, his sentence indeterminate. Jackson immediately found trouble on the inside too when guards took an instant dislike to him and his sentences were extended following events occurring at Soledad State Prison in which three Black inmates and a white guard were killed. Using his time in solitary to educate himself, Jackson studied psychologist Franz Fanon (The Wretched of the Earth), Marx, and Mao, and came to understand the incarceration of poor Blacks for petty crime in a political context. A leader in moving prisoners to radicalize, Jackson joined the Black Panthers and became one of the group’s most celebrated members. However by 1969, J. Edgar Hoover had declared the Black Panthers to be public enemy number one and set out to decimate them. Nevertheless, Soledad Brother: The Prison Letters of George Jackson was published in 1971 and was greeted by a positive reception by intellectuals and political progressives. That Jackson had been framed for conspiring to kill a guard in the Soledad incident was a widely held belief; his defenders were vocal and his case was a cause célèbre. But a few days before the Jackson trial was to begin, a riot broke out in San Quentin in which inmates and guards were again slain and Jackson was among those killed as he ran across the yard in an alleged escape attempt. Less than a month after the prison shooting in California, a historic event at Attica Correctional Facility wherein prisoners took control of the prison to protest its poor conditions resulted in more fatalities—an unmistakable call for prison reform. Perhaps it was the call to which Dylan was responding when in November, he cut and released “George Jackson”, a 45-rpm record that reached the Top 40 in January of 1972. Opening with the blues trope, “I woke up this morning,” Dylan’s “George Jackson” is not a typical blues song, though it surely addresses the larger topic of racial and socio-economic oppression from which a certain style of blues was born. It also leaves a record of Jackson and his story. Dylan cut two versions of “George Jackson” for a double sided seven-inch: A “big band” version featuring Kenny Buttrey (drums), Ben Keith (steel guitar), and Leon Russell (bass), and a solo acoustic version. Among the various issues of the single—and there are many—is a picture sleeve with an image of Dylan performing at the Concert for Bangladesh; it remains sought-after by record collectors. The details of the George Jackson case are still debated today by scholars, historians, and those who remember the events. Last year, the last incarcerated member of the San Quentin Six, Hugo Pinell, was killed while serving his life sentence, much of it in solitary confinement. February 4 is the birthday of Rosa Parks, the rebellious civil rights activist remembered most for refusing to move to the back of the bus: The Montgomery Bus Boycott, in the name of the desegregating public transit, was organized immediately following her arrest on December 1, 1955. Born Rosa Louise McCauley in Tuskegee, Alabama in 1913, Parks was a student of non-violent protest and an active member of her local chapter of the NAACP in Montgomery. Her refusal to move on the bus that day was not part of any kind of group action or occupation—she held her seat on her own steam–though she knew her rights, the protocol for civil disobedience, and the possibility of taking an arrest. In the immediate aftermath of sitting down for racial equality and desegregation, far from receiving any heroine’s awards, Parks paid a price for asserting her right to ride. She could no longer find work in the Montgomery area; she and her husband Raymond moved north, eventually settling in Detroit where she worked the better part of her life as a secretary for US Representative John Conyers. Parks would one day receive the highest honors in the land– from the NAACP’s Spingarn Medal, to the Presidential Medal of Freedom (awarded to her by President Bill Clinton), and the Congressional Gold Medal. A new political biography of Parks details a life dedicated to seeking justice, from the Scottsboro Boys case to the anti-apartheid movement. Parks remained particular and protective of her legacy: She slapped legal actions on filmmakers and recording artists who wished to use her name and likeness, though “Sister Rosa,” a tribute to her by New Orleanians the Neville Brothers, was cleared to appear on their 1989 album, Yellow Moon. Produced by Daniel Lanois, and accompanied by The Dirty Dozen Brass Band and Brian Eno for the sessions, Yellow Moon is an exceptional record. The band transforms two Bob Dylan songs (“With God On Our Side,” “The Ballad of Hollis Brown”), the Carter Family classic “Will the Circle be Unbroken,” Sam Cooke’s civil rights anthem, “A Change is Gonna Come,” and Link Wray’s “Fire and Brimstone” (title self-explanatory, taken from the guitarist’s obscure and brilliant 1971 album). Standing alongside the Neville Brothers’ bayou-fired originals, “Sister Rosa” is their attempt at rap. For more information on Rosa Parks, visit the Rosa and Raymond Parks Institute. For more information on the Neville Brothers, visit their website.